The Marshall Islands have few natural resources, and their imports (things they bring into the country) exceed exports (things they send out of the country) by nearly three times. Farm products include coconuts, tomatoes, melons, taro, breadfruit, fruits, pigs, and chickens. Industry consists of the production of copra and craft items, tuna processing, and tourism. Marshallese society is matrilineal (tracing their ancestors through their mother), and land is passed down from generation to generation through the mother. Lucky long remembered the great grape lollipop argument. Inside the store, Lucky looked around and chose his favorite candy, a grape-flavored lollipop, which cost 25 cents. Walking back home, Lucky unwrapped the purple lollipop and stuck it in his watering mouth. As he happily sucked on the sweet candy, Evan stopped him. “Hey, can I have some of your lollipop?” asked Evan, who was three years older. The request was not unusual. In the Marshall Islands, friends share everything, and it is considered impolite to refuse a request for something. Even gum that has already been chewed is shared. It is common for someone to chew gum and then pass it on to someone else to chew. Evan was shocked, and then he got mad. It was impolite not to share, and Lucky’s tone of voice made him even more upset. “It’s not like you to say that in such a rude way!” Evan exclaimed. He muttered some bad words about Lucky and stalked off. A year passed. Then one day a special guest arrived at Lucky’s school, the Ebeye Seventh-day Adventist School. The guest, Walter John, a pastor from another island, led a week of prayer at the school. The pastor spoke about heaven, a home where Lucky could live with Jesus forever. At the end of the week, the pastor asked the schoolchildren who wanted to give their hearts to Jesus. Lucky asked to be baptized. His teachers were overjoyed about his decision, but they told him that he had to get permission from his parents first because he was so young. Lucky felt nervous about asking his parents because neither belonged to the Adventist Church. But both his mother and his father said he could be baptized if he believed that it was the right thing to do. Lucky was baptized with six other students in April 2017. Often when people make mistakes, God gives them a second chance to do better. Lucky realized that he had made a mistake by speaking rudely to his friend about the lollipop, and soon after his baptism he had a second chance to respond in a kinder manner. Eoata wasn’t offended at all. She just smiled. Lucky said he is happy that he was baptized, and he is looking forward to living forever with Jesus. “Jesus is my Savior, my Cornerstone,” he said. 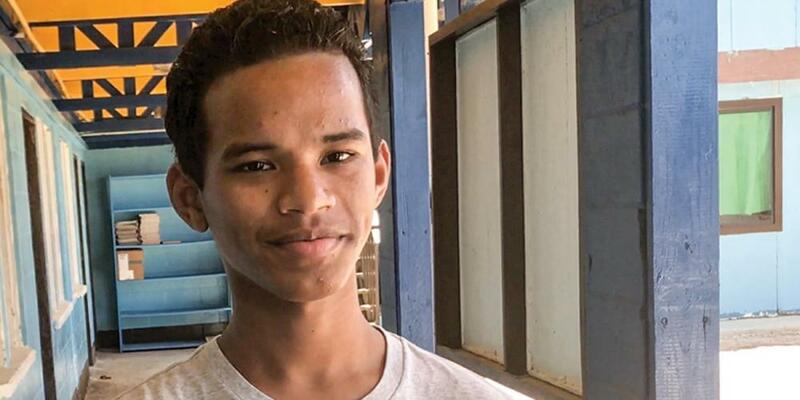 Lucky is one of 240 students, mostly from non-Adventist homes, who are studying at Ebeye Seventh-day Adventist School. Part of this quarter’s Thirteenth Sabbath Offering will help the school made urgent repairs to its classrooms. Thank you for your mission offering.